So arrangements are made and we are expecting to move from this office to our next one in a couple of weeks. While we are excited about having a new workplace with more luxuries, we are also looking forward to add our first official Google Places profile to our business. This profile will place a pin on Google maps directing people to our business location. 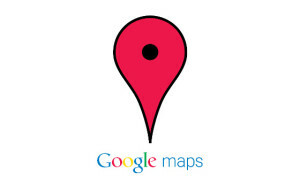 Google Places are an important and must have feature for businesses as it allows their customers to locate their office on a huge map. If you have ever searched for a business online, then we are sure that you have gone through Google Places Profile to find the location of your target business. What are Google Places & how it works? Google Places act like an official business listing for your business. These listings are ordered in by address and phone number of your business on Google maps, allowing your potential customers to locate your business on map. 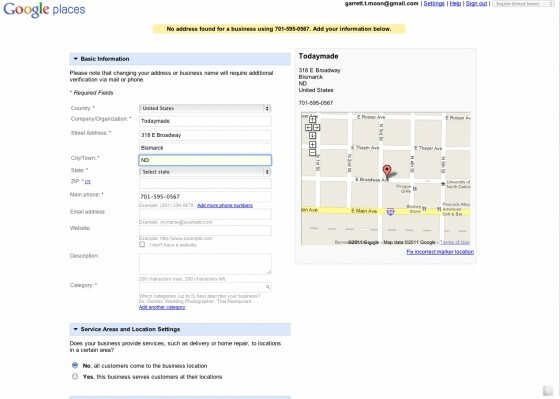 You can compare Google Places with business listings of Craigslists and Yellow pages available online. They are more or less similar to each other and sole purpose of these listings is to make your business appear in top searches. The reason why people tend to use Google Places for their business is that when they are searched online, their Google Places profile with location of their business must come at the top. Getting your Google Places business profile is not just about adding your number and address in the listing and dropping a pin over the map, but it also allows you to add detailed description of your business and insert logo of your company as well. And the best thing is it’s free for ALL. How to own your Google Place? Browse Home Page of Google Place to claim your Place (http://www.google.com/places/) and select “Get Started”. It is located right under title “Getting your business found on Google”. The next page will require you to enter login details of your Google Account. Google Places acts like a traditional phone directory and the very first thing that Google asks you to do is to your search for your number. 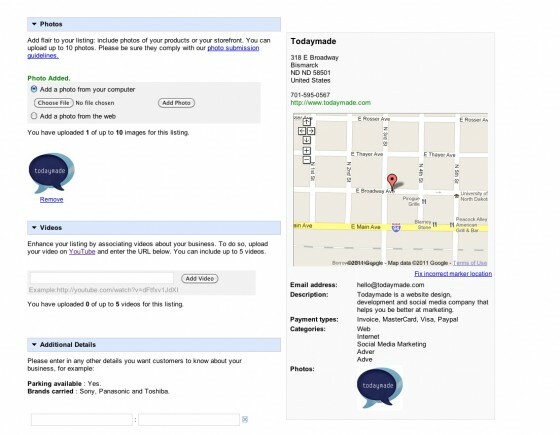 If your business is present online then chances are that Google might have created a Google places business profile. Phone search will confirm that whether you are already available with an authentic Google places profile or not. The next step in this process involves you in adding basic information about your business into Google’s database. In this step you can include general information about your business like phone number, address, email address, description of business, link to official website. There are different fields given and we recommend you to include all information about your business. This feature adds class and standard to a business. Google allows you to furnish your business listing by adding hours of operation. This will allow your customers to reach your office in working hours. Google allows you to add photos and videos to your official business listings so that your customers may understand what exactly you do. If you don’t have any media at the moment available with you then you should at least add the logo of your company here. If you have any informative video available about your business, then add it. There is no need to go crazy by adding useless stuff at this stuff. However, adding useful media to your business listing will add class your business listing. Google offers a great deal of space for you to add extra information about your business. In this step you can add services being offered by your company. Add names of brands if you are running a retail store. Try to add SEO friendly content in this area so that Google may be able to link your business to the maximum number of local searches. Once you are done with adding information and details about your business, click on Submit button to enter into review and confirmation process. 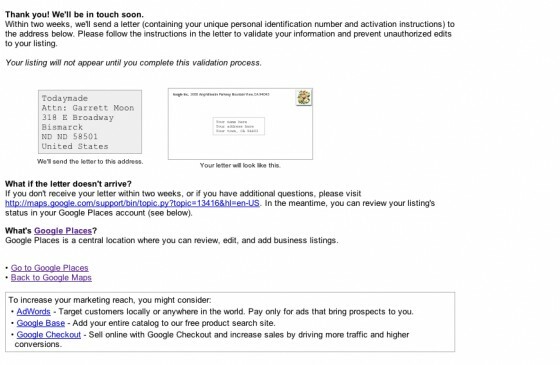 IN this final process, Google physically mails you a card to your business location. There is a short code printed on that card which you can use to confirm your business listing. This is merely a security purpose confirmation by Google to prevent claiming of your location by someone else! That’s it! The process is simple, quick and effective. People often ask about how to get better in Google rankings and among many other ways, this one is effective and important for every business. Once you are done with claiming your business location, you can edit it, add additional information to it and change logo of your company any time you like.